Now IASB’s Online Learning Center is offering members a second chance to get that important information. IASB is presenting the Naperville workshop as an Online Learning Center course. The Naperville event was presented by Melissa D. Sobota and Shelli L. Anderson, attorneys from Franczek, P.C. 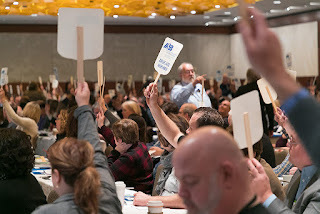 More than 200 board members and superintendents attended the live events. But the online course represents a second chance for members to see and hear what they did, and examine trends in collective bargaining. Register for this course to learn about key collective bargaining issues such as: compensation, benefits, working conditions, the Janus decision, and more. The cost of the online course is $20. Go to iasb.com and log in through the gold MY ACCOUNT option in the left margin of the homepage to learn more. IASB is seeking nominations for the 2019 Holly Jack Outstanding Service Award. All eligible nominees must be school district employees (superintendent’s secretary, superintendent’s administrative assistant, school board recording secretary, etc.) who have performed the duties of the board secretary for a minimum of five years. The recognition award was created to honor long-time IASB employee Holly Jack, who worked as a field services administrative assistant and was instrumental in developing training for district secretaries and administrative professionals at the Joint Annual Conference. Nominees for the Outstanding Service Award should demonstrate characteristics similar to those exhibited by Holly Jack in her work with districts. Qualifications include a constant desire for self-improvement, passion for public education, dedication toward improving the quality of life and quality of education for those in the community, independent problem-solving abilities, innovation within the work environment, and a drive to empower and equip colleagues with knowledge allowing them to reach their full potential. Nomination forms must be signed by the superintendent and the board president. Up to five letters of support from individuals are allowed in addition to the nominating form. The deadline for submitting all related nomination materials is September 30. Applications and past winners of the Award can be found on the IASB website. The winner will be selected by a panel of impartial judges and be notified immediately after the decision. The award will be presented in November during the Administrative Professionals’ Program at the Joint Annual Conference in Chicago. For more information, contact Peggy Goone at 217/528-9688, ext. 1103; or by email at pgoone@iasb.com. 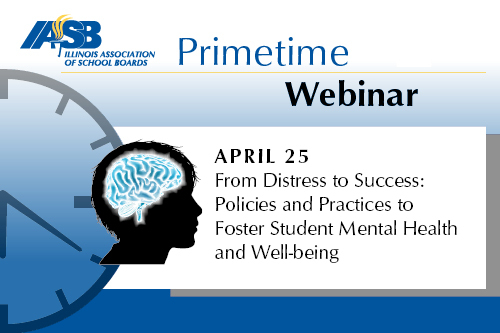 IASB will be hosting a newly created webinar focused on the importance of mental health and well-being policies and practices for students. Glenn “Max” McGee, a former Illinois state superintendent, author, and nationally recognized speaker on the topics of student mental health, educational leadership, and public policy will be presenting the one-hour learning opportunity. The April 25 webinar will be held at a new time, 7 p.m. Titled, “From Distress to Success: Policies and Practices to Foster Student Mental Health and Well-Being,” McGee will explore existing beliefs about students’ mental health, examine “distressors” students are faced with, and propose changes in policies and practices that act to support student mental health. The free webinar will take place April 25 at 7 p.m. Past webinars on topics ranging from school funding and educational equity to pensions and policy updates are available through IASB’s Online Learning Center archive free of charge. The Illinois State Board of Education has announced its April 17 board meeting agenda will include discussion of the statewide teacher shortage. The agency is encouraging school stakeholders to attend and comment about the shortage during the meeting’s public participation segment. Planned topics include educator testing and innovative approaches to addressing the teacher shortage. School leaders can access the meeting information packet, including the agenda, here. The State Board’s entire meeting will be audio cast on the internet at www.isbe.net. 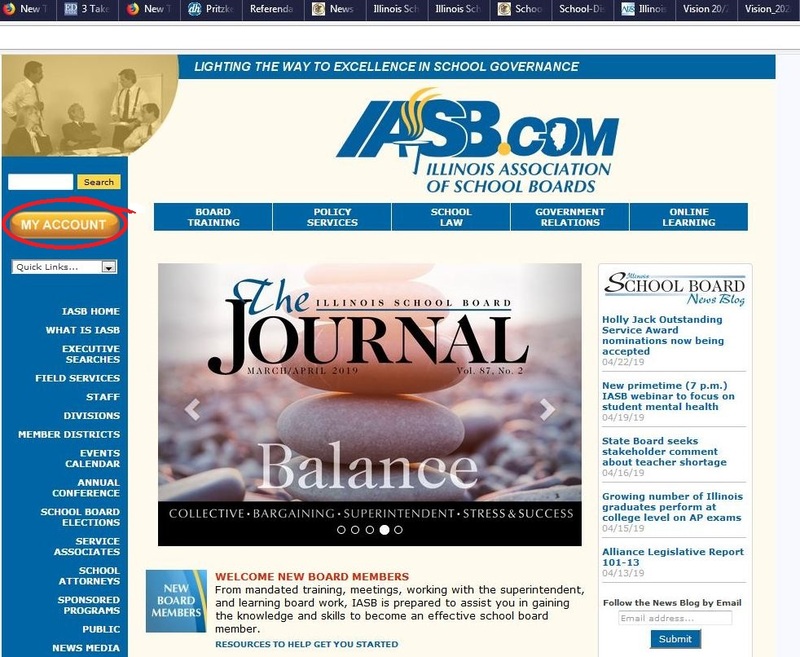 Click the “LISTEN IN” link at the bottom of the ISBE home page at the start of the meeting. the Class of 2018 AP District Honor Roll, a new report shows. Illinois ranks 10th in the nation for the percentage of 2018 graduates – 27 percent – who scored at least a 3 on the College Board Advanced Placement exams during their high school career. The national average is 23.5 percent, according to the new AP Cohort Data Report. AP exams measure a student’s content mastery of college-level studies in specific academic disciplines. A score of 3 or higher on an AP exam demonstrates that a student is capable of doing the work of an introductory-level course in a particular subject in college. Illinois also continues to report record numbers of graduates taking AP exams, with nearly 41 percent of graduates taking an AP exam during high school – up from 22.5 percent in 2008. The percentage of Illinois graduates who scored a 3 or higher grew by 8 percentage points from 25 percent in 2015 to 27 percent in 2018. Illinois is fifth in the nation for the largest percentage point increase over the past decade in the percentage of graduates scoring a 3 or higher on an AP exam during high school. Additionally, the College Board named Fenton High School District 100 in Bensenville the national AP District of the Year among all small-sized school districts in the United States and Canada, based on the district’s increases in AP access and achievement. Illinois school districts have won AP District of the Year awards in six of the past nine years. Twenty-two Illinois school districts made the Class of 2018 AP District Honor Roll. View the full list on the College Board website. 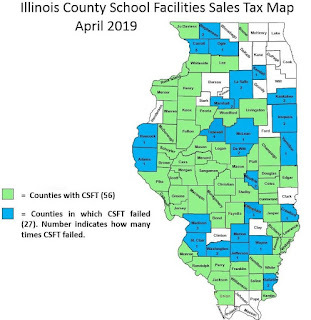 A growing number of school districts were financially solvent in fiscal year 2018 thanks to increased EAVs, growth in state revenue, stable district expenditures, and less borrowing than in previous years. Those are the key findings from the Illinois State Board of Education’s annual financial profile report. The ISBE analysis also shows a jump in the number of school districts earning the best state designation, “financial recognition,” with fewer districts falling into the poorest designation, “financial watch list” status. As mentioned, higher EAVs, meaning rising property values, helped boost levy and debt capacity, even as state revenue increased $1.2 billion (19.3 percent) from the previous fiscal year. In all, 695 districts earned “financial recognition,” the highest total in the 16-year history of the financial profiles, up from 640 in fiscal 2017. Meanwhile 111 districts were in the “financial review” category, a decrease from 147 the previous year. Thirty-three districts were designated in the “financial early warning” category, down from 43, while 12 districts landed in the “financial watch” category that can sometimes lead to state intervention, down from 22 districts. The number of districts that relied on deficit spending to get through the school year dropped to 116 from 344 in last year’s profile. But that number is projected to rise in the current fiscal year – and be reflected in next year’s report – to 310, based on estimates submitted by districts. That projection could change however, if additional tier funding to districts is provided under Evidence Based Funding (EBF). 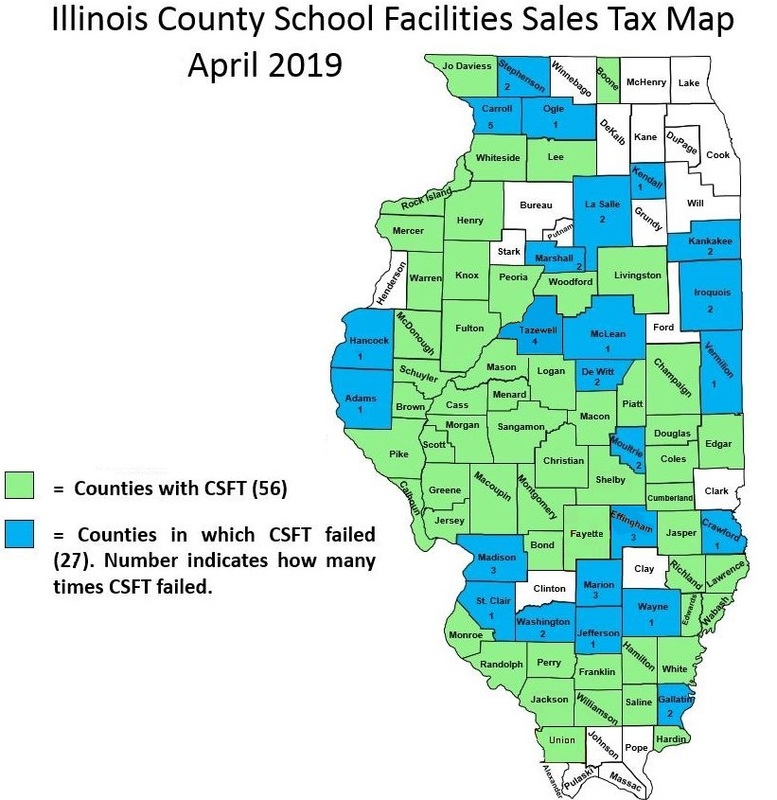 That is, if lawmaker fund EBF as planned, and if continued increases in property tax revenue from rising EAVs continues to improve the financial outlook for some school districts. The Illinois General Assembly finished another busy week in the Capitol, but has left much work to be done before it hits the half-way point of the legislative session. Both the Senate and House of Representatives adjourned for the week and are scheduled to return next Tuesday. Next Friday is the deadline to have bills considered in their house of origin. So all House bills must be considered on the House floor and all Senate bills must be considered on the Senate floor by then. Both chambers will then recess for two weeks, returning to Springfield on April 30. Hundreds of bills are still awaiting action on the chamber floors, so expect a frenetic pace next week. House Speaker Michael Madigan has already alerted his members to be prepared for long work days, even into the night. Participation in the legislative process by school board members is crucial at this point of the session. After slogging through thousands of bills earlier in the spring, there is a slightly clearer picture as to which issues are seriously moving through the process. School board members contacting their legislators to let them know how legislation will affect their school districts can determine the outcome of legislation in many cases. All bills will be up for a vote next week, including several controversial pieces of legislation highlighted in previous IASB Legislative Reports. Even for school board members who have contacted their legislators previously on an issue, it is important to make that contact again before next Tuesday. Details about the following bills can be found in a previous IASB Legislative Alert. Click below for the status as of April 5.